It's a deep Diya which is used to offer jyot, kapur and even dhoop during pujan. 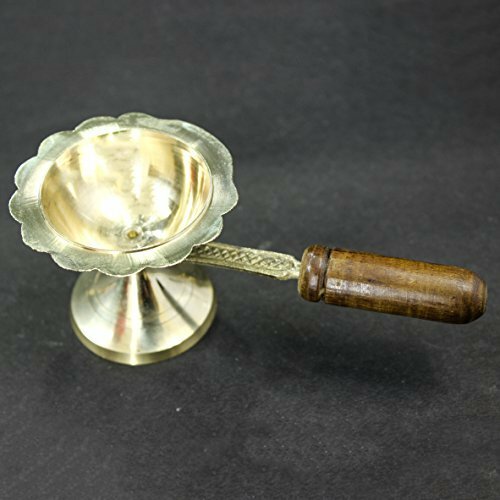 This diya is in pure brass and have a wooden handle for comfortable grip even when the diya is hot. Every Hindu/ Vaishnav Family lighten up a Diya before Lord in the morning and evening, in home and in workplace. This pleases the Lord and also removes away all negetive energies from the place. A pure brass deep Diya is very durable and safe to use.Its wooden handle donot allow heat to be transmitted to hands. A very Durable and sober Brass diyas, from the house of Brand "The Holy Mart", Always Serving In Your Spiritual Journey. If you have any questions about this product by The Holy Mart, contact us by completing and submitting the form below. If you are looking for a specif part number, please include it with your message.